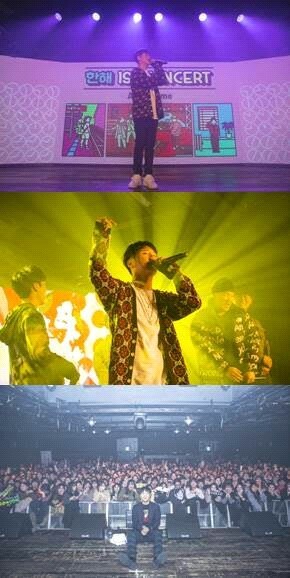 The popular rapper, Hanhae, successfully finished his first solo concert 'About Time' at Hyundai Card's UnderStage last Sunday. Before the release of their second mini album and the military service of Hanhae, the concert was held which was arranged for fans who have encouraged and loved him, and the tickets were sold out in just a minute at the same time as the reservation started. Especially this concert is a performance that summarizes the time since his debut until now, the songs that he made his debut as Phantom, the songs he performed as solo, and the songs that he showed in 'show me the money', he performed with fancy guests such as Verbal Jint, Dynamic Duo, Cho Woochan, Reddy, Noel, Yezi, Kim Kiri, Ugly Duck, Digiri, Kiggen. His solo concert “about time” Started with the song ‘365’ in His first solo mini album, and with the surprise appearance of dynamic duo, Rhino and Cho Woochan showed their collaboration song “come to the lobby” and “1/N” together. After "Organic" with Noel and Reddy, Kiggen, who shared joy and sorrow with Phantom, he sang "like Jo Yong pil" and "hole in your face," together with his musical father Verbal Jjint. The finale came to the end with the release of his new song of his second mini album, which will be released on February 8. He successfully finished his first solo concert "About Time" to give precious memories to his fans along with his guests, and will start his military service on February 7, and he will be delivering his second mini album to his fans on February 8.